Historic details meet Hollywood glamour in this elegantly appointed bath. English Tudor style is known for dark woodwork and half-timbering, but the classic decorating style takes a lighter turn in this bathroom overlooking Fort Lauderdale’s Tarpon River. To suit the Florida setting, the house has a fresh slant throughout—the doors and plank flooring are bleached oak, for instance, and the moldings are painted white—but the distinctive archways, paneled walls, and carved details all hark to English Tudor style. A sculptural tub is the centerpiece of this octagonal bathroom. Positioned opposite the entry from the bedroom, a marble-lined dressing-table alcove creates a stunning backdrop. The tub leans toward modern, but the room’s other details reflect the old-world architecture. A vintage-style tub filler with a handheld shower serves the modern tub. The marble flooring is a custom mosaic. The floor and the back wall of the dressing-table alcove feature a marble inlay with a quatrefoil pattern (a four-leaf design popular in old Gothic churches). 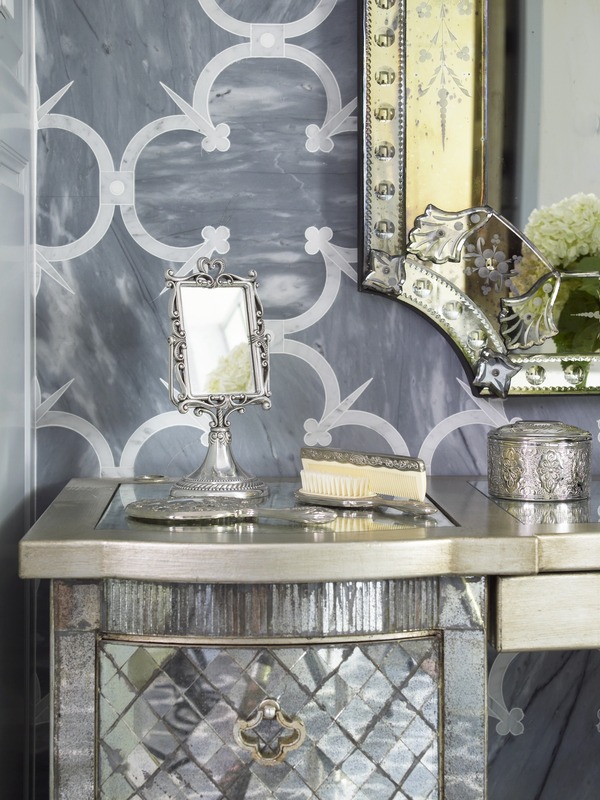 The mirrored dressing table is paired with an antique wall mirror. 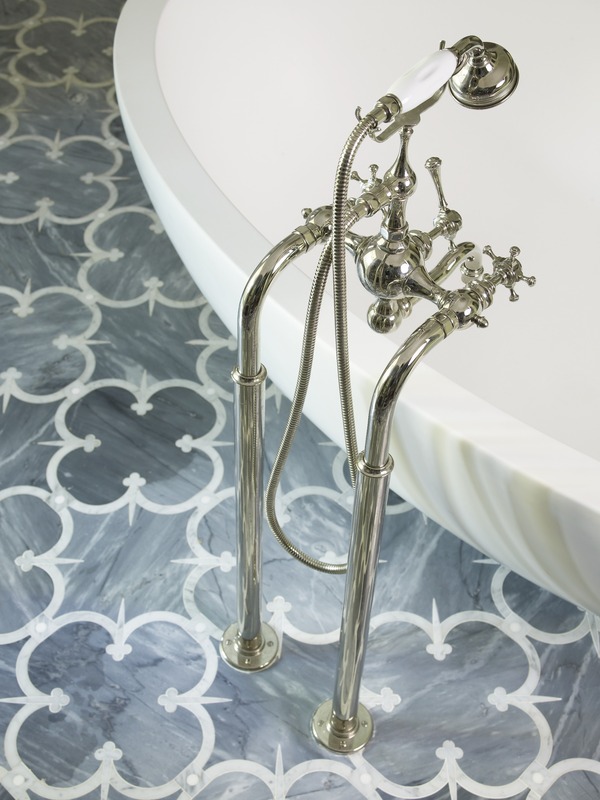 A marble mosaic with a quatrefoil pattern spans the alcove’s rear wall, matching the bath’s floor tile. A fancy antique wall mirror partners with the dressing table to up the glamour quotient, while white sink vanities continue the historic theme with raised carvings in a Tudor rose pattern. 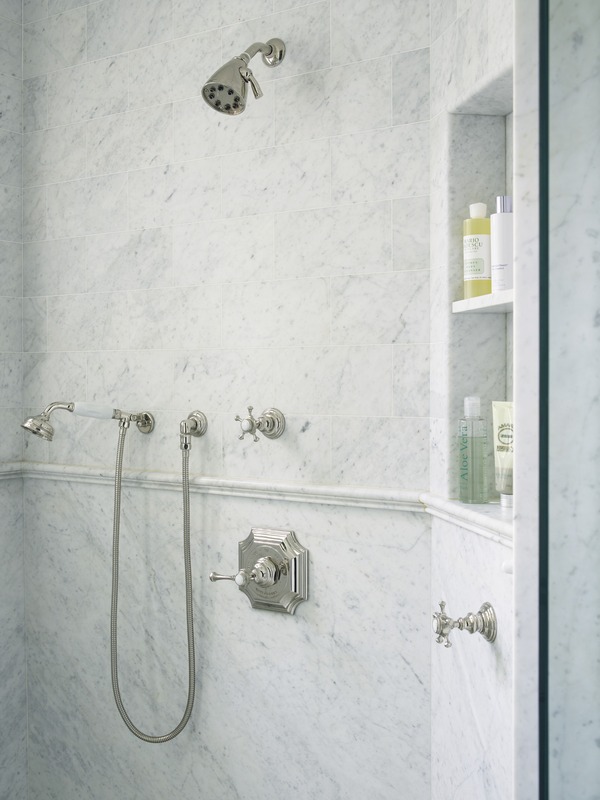 Despite the bath’s glamorous shine, gray-and-white marble establishes a quiet mood. “There is a real serenity to gray,” Taylor says. Showerheads are placed on opposite walls in the curbless two-person shower. 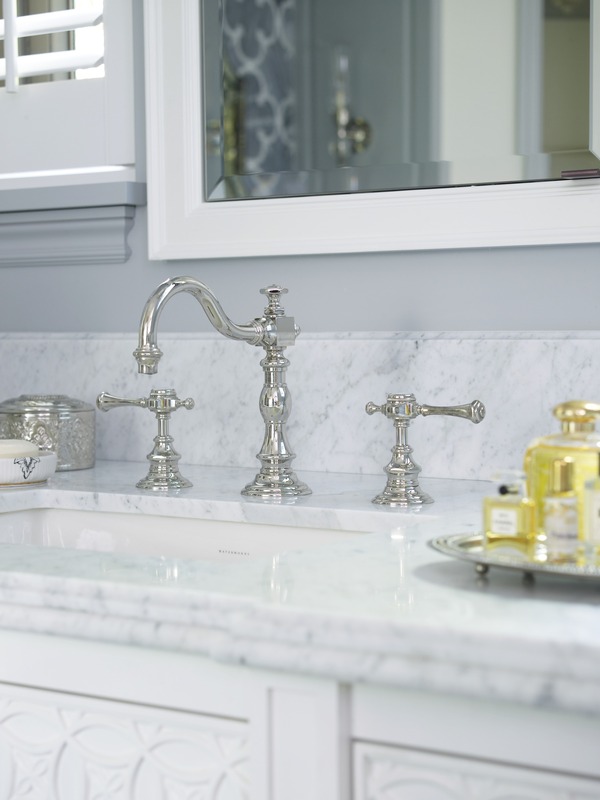 Cross-handle faucets with porcelain accents and Carrara marble surfaces add vintage style. Here, the gray makes the white vanities pop, softens the strong Florida light, and keeps the space from feeling “too glitzy.” The resulting look is calm, but not dull, Taylor says. “You can keep monochromatic schemes from being boring by introducing different shades of one color,” she explains. 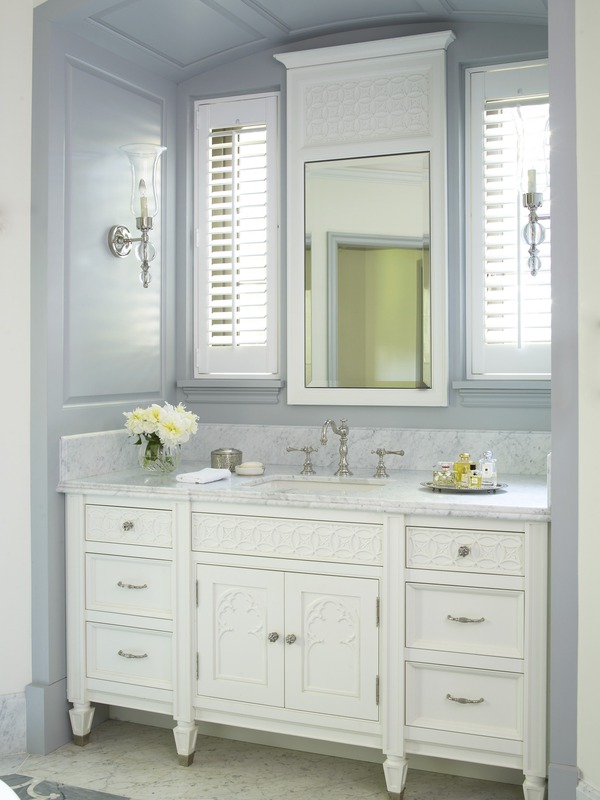 This bath’s painted paneling is a pale bluish gray, for example, which complements the Carrara marble atop the sink vanities. 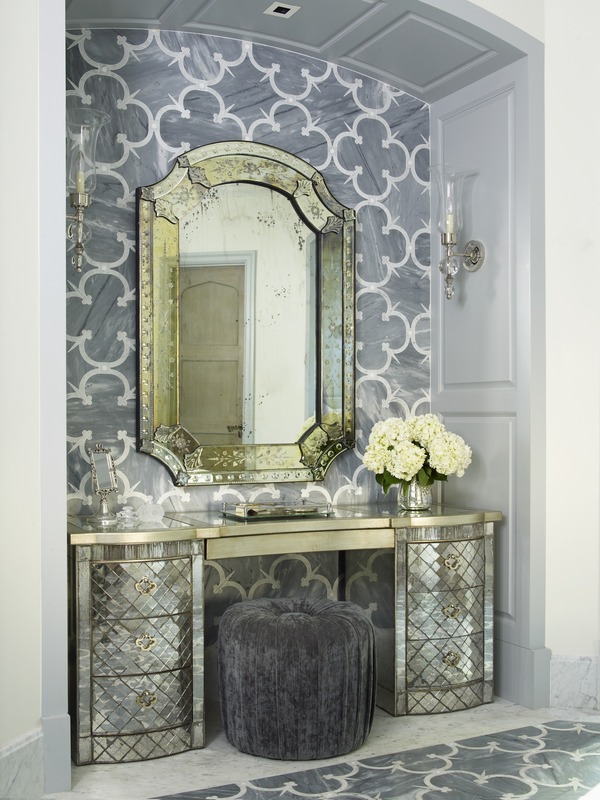 The floor’s quatrefoil mosaic is a foggier gray, while the velvet-covered stool at the dressing table is deep charcoal. Painted paneling surrounds the matching sink vanities (this one’s twin is across the room). Neither too masculine nor too feminine, the room suggests a storybook fantasy: A royal bath in a castle has been reimagined with modern luxuries and made fit for Hollywood royalty. It has “a serious, stately side,” Taylor says—and just the right amount of bling. Polished-nickel fixtures complement warm tones in the Carrara marble countertops. A Tudor-rose pattern adds interest to the cabinetry.